DULLES, VA - (@The Comedy News) - An old rusted technological relic from the Ronald Reagan years made a flyover of Washington, DC today, on its way to the Smithsonian aviation museum by Dulles Airport. The DeLorean DMC-12 time-machine, now retired, was transported by a NASA 747 Carrier Aircraft from Hill Valley, California to the Udvar-Hazy Center in Virginia where it will be on permanent display. Originally manufactured by Dr. Emmett Brown, the DeLorean was first piloted by high school dropout, Marty McFly on October 26, 1985. Although Dr. Brown's time-travel program has long since been defunded and discontinued, people around the world are fascinated by the DeLorean time-machine's impressive abilities and sleek appearance. "I'll miss it's doors that open upward," said Alex Reeves while wiping back nostalgic tears. "I'm just glad that this rusted, overpriced, out-dated, flying hunk of 1980s funky junk will be in a museum. 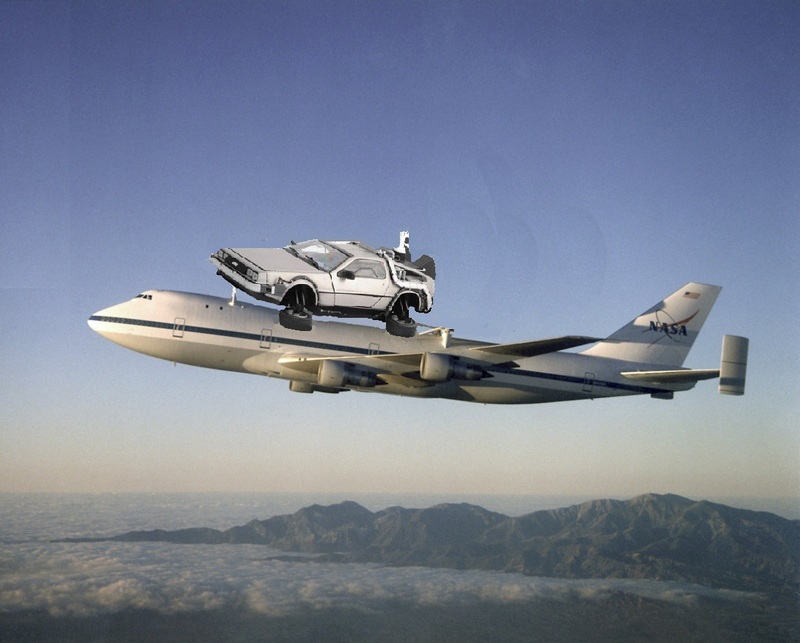 My grandkids will know about a quaint exciting time not long ago when time-travel was possible." Many onlookers held signs on the Memorial Bridge between the Lincoln Memorial and Arlington National Cemetery, welcoming the defunct time-machine to DC. Some revelers were playing the song "The Power of Love" on boomboxes to get in the time-travel mood. 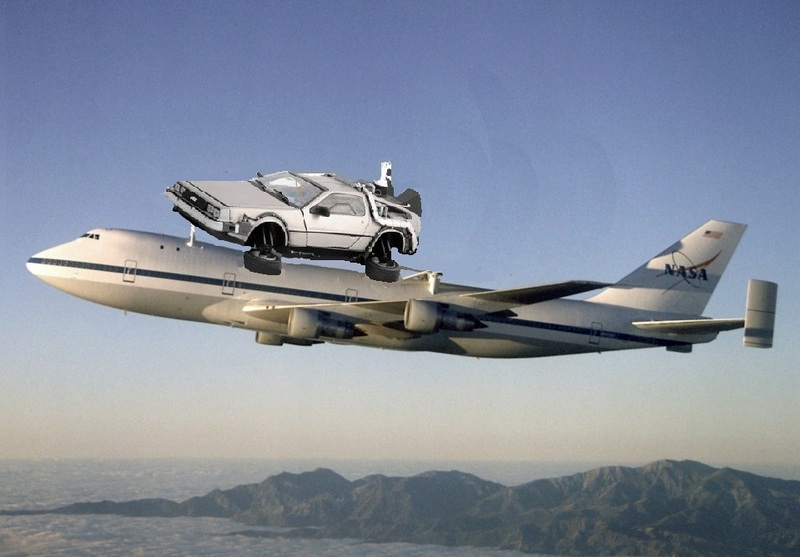 Some objected to the flight of the time-machine over Washington, DC---particularly due to it's position on top of the 747 Carrier Aircraft. The Family Research Council, a conservative 'pro-family values' lobby group, lamented today in a press release that, "parading two flying objects latched together in a sexually explicit position is not the kind of message we want to send to children. Particularly letting the little sin-machine sit on top. It's un-American, lude, wasteful, and a poor showing of judgement." The DeLorean time-machine went on several journeys throughout the space-time continuum, spanning from the year1885 and into the future as far as the year 2015. However, the 27-year old vehicle does not hold the record for space-time continuum travel for devices manufactured in the 1980s. That title belongs to a small phone booth located in San Dimas, California. The time-traveling phone booth currently belongs to the George Carlin estate. "Google Goggles: Who Needs Privacy When You Have the Eyes of a Champion?" MOUNTAIN VIEW, CA - (@The Comedy News) - Former NBA star Horace Grant is the new spokesman for Google's latest invasion of user privacy---the Google Goggles. "As the world's most famous wearer of oversize novelty glasses, I think Google Goggles are a slam dunk!" Grant announced as part of Google's advertising campaign. "Now, with Google Goggles, you can look like a 4-time champion! Who needs privacy when you have the eyes of a champion?" Nicknamed 'Project Glass', Google expects its revolutionary goggles to invade users privacy more than ever. Google's business model seems to do more than just invade peoples lives with still-photos and video footage. Google hopes that the Goggles can literally see the unique view that users have only recorded in the privacy of their own minds. 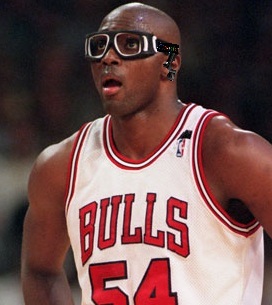 "Horace Grant. True Patriot. Born on the Fourth of July [in 1965]. Don't you wanna SEE like HORACE? Try the Google Goggles. You may not score very much or at all, but it will definitely give you the ASSIST you need in life." Google expects the Goggles to fail and be discontinued by December of 2012.